I have written a lot about condominium owners bringing up their children in Toronto rather than the 905 areas for a variety of reasons. For many, living in Toronto means a short work commute, resulting in more time to spend with their children. Add to that the convenience of maintenance fees covering the repair and upkeep of the grounds, exterior, amenities and other shared areas, and the lifestyle is certainly appealing. Remember, too, that Toronto is home to amenities and attractions that appeal to all ages, including youth. In response to this growing demand, our developers are designing with families in mind. One example is Canary Commons, the fourth phase in the fabulous Canary District community in Toronto’s Downtown East. About 2/3 of the nearly 400 suites in this condominium are two-bedroom, two-bedroom + media or den, three-bedroom and three-bedroom + media or den layouts, in sizes from approximately 600 to 1,359 square feet. These large, gracious designs are perfect for end-users who have children. The condominium will even include a Children’s Play Area among its amenities, along with barbecue and fitness areas, a dining room with catering kitchen, lounge, pet wash room, yoga and Pilates studio, and theatre room. Remember, too, that Canary District is home to the Cooper Koo Family YMCA with activities for all ages. These include after-school programs and childcare facilities. 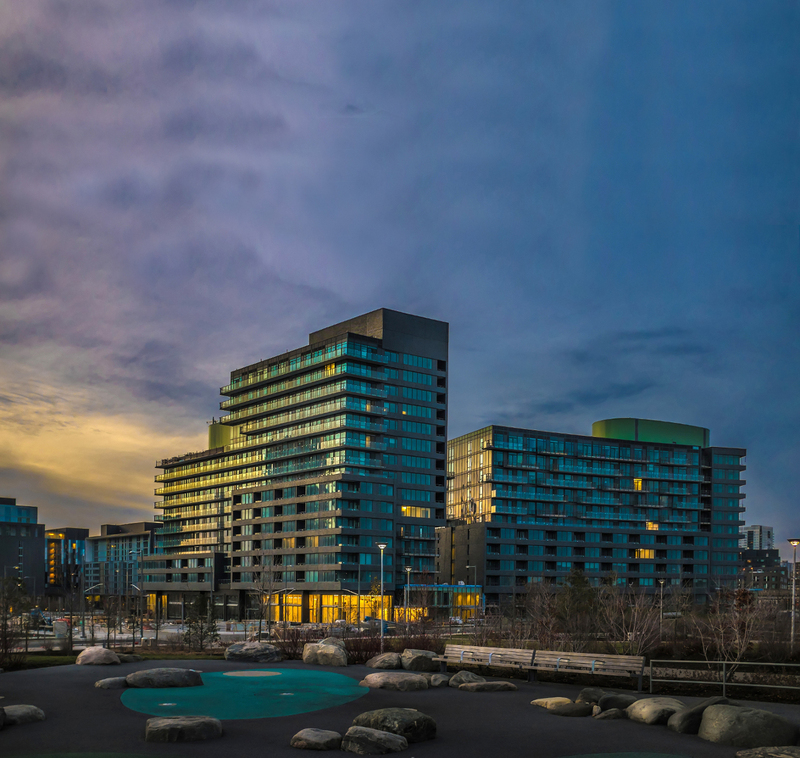 Plus, Canary District is connected to the wonderful 18-acre Corktown Common Park, which encompasses a marsh, landscaped lawns, playground areas, a splash pad and communal picnic area. By the time Canary Commons occupies, more amenities will be added to the area. The mood in Toronto’s east end is buzzing with excitement, as demand for new condominiums is driving sales. The areas east of the Don River, such as Leslieville, Riverside, Corktown, Riverdale and Greektown, are considered among the city’s most trendy neighbourhoods. Resale homes are going quickly, and we are even hearing of some bidding wars. Price is part of the appeal, as east-end prices haven’t skyrocketed the way some other sections of Toronto have. Certainly, the revitalization of the Distillery District has been a catalyst for this popularity. Leslieville is a vibrant emerging area, where condominium developers such as Streetcar are building enticing residences. Riverside Square, for example, is located at 79 East Roadway and offers the convenience of retail spaces on the ground level fronting Queen Street. Now under construction, 21-storey East United Toronto Condos is located in Old Toronto at 95 Berkeley at King – an address with a near-perfect Walk Score for walkers and bicyclists. Developed by SigNature Communities, Berkshire Axis Development and Andiel Homes, this stylish condo will inject new architectural life into the area. Designed by Giannone Petricone Associates, the exterior encompasses the red-brick Christie, Brown & Co. stables building constructed in 1906. 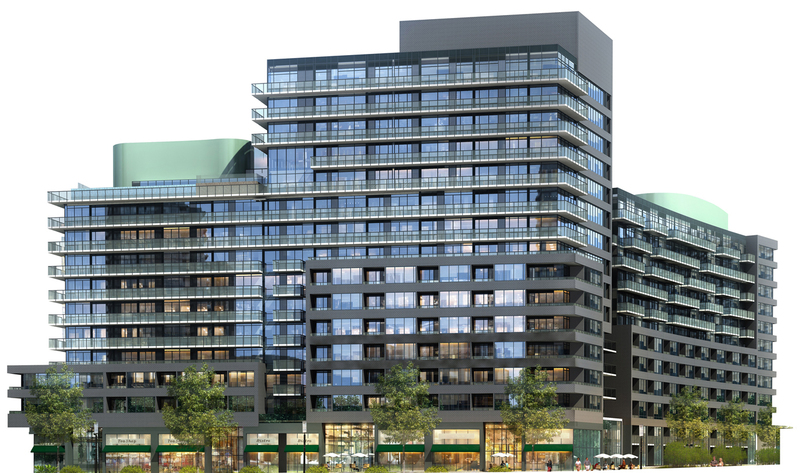 The Gupta Group is offering SkyWatch Condos, the second phase at The Rosedale on Bloor, at 387 through 403 Bloor Street East, east of Yonge and just west of Sherbourne. What an opportunity to live atop Canada’s first 4-Star Canopy by Hilton Hotel in this desirable area! 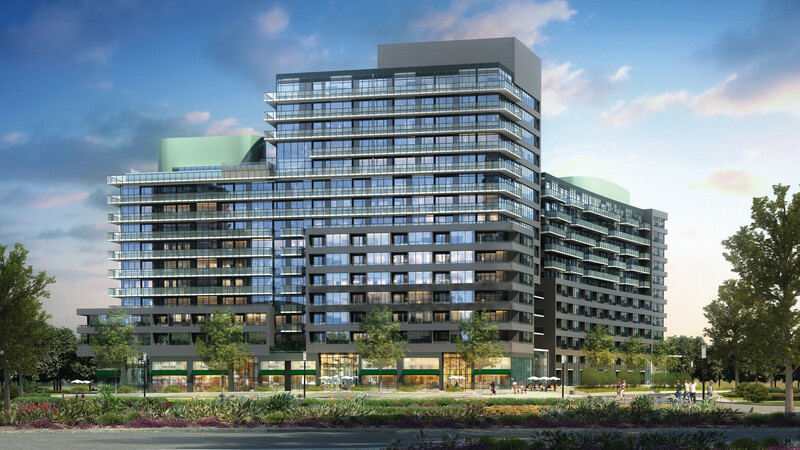 Monde Condominiums is Great Gulf’s highly successful waterfront residence at Sherbourne and Queen’s Quay East, directly beside the incredible and beautifully landscaped Sherbourne Common Park. What an amazing amenity to have in your backyard! And as waterfront land available for development dwindles, this is an opportunity not to be missed. And of course, the Canary District community continues to thrive adjacent to Toronto’s 18-acre Corktown Commons Park, which features a playground, amphitheatre, splash pad, pavilion and hundreds of trees. Dundee Kilmer has focused on offering an exceptional quality of life in this community known for being the site of last summer’s Pan Am/Parapan Am Games Athletes Village. The neighbourhood’s overall theme is wellness. It incorporates a YMCA and retail venues geared to active residents. These are just a handful of the condominium opportunities you will find in the east end of Toronto. Happy shopping! The countdown is on to the eagerly awaited Pan Am/Para Pan Games in Toronto, a driving force in the city’s summer excitement. In the June 16th Toronto Star, acclaimed architecture critic Christopher Hume praised the Athletes Village as a model of Canadian urbanism in the West Don Lands and the developer, Dundee Kilmer, for its “architectural aplomb” in creating a memorable neighbourhood. Once the games are over, their spirit will live on in the condominiums, facilities and public realm of Canary District, BILD’s 2014 Community of the Year. Dundee Kilmer’s theme for the pedestrian-friendly community is health and wellness, and it gives new meaning to the phrase “live, work and play.” The neighbourhood features wide tree-lined walkways connecting a YMCA, George Brown College student residences, retail stores, cafés, restaurants and recreational services. Residents can also stroll to the shops and galleries of the recently restored Distillery District urban village. Currently, Dundee Kilmer is selling Canary Park Condominiums + Townhomes, a mid-rise residence facing the new 18-acre Corktown Commons Park, which features a playground, amphitheatre, splash pad, pavilion and hundreds of trees. The residence is also situated where the new Front Street Promenade begins. This is truly the opportunity of a lifetime. NOW is the time to explore your residential choices. The new Presentation Centre is located at 9 Mill Street, between Parliament and Cherry Streets. Visit www.canarydistrict.com or call 416-603-7576. CMHC statistics show that one-person households are on the rise in Canada, and that by the 2020s will be the single biggest type of household. Women represent a significant percentage of this trend. As of 2011, the most recent year for available data, 65 per cent of condo owners living alone were women – and that percentage rises to 76 for women 55 years of age and over. At Baker Real Estate Incorporated, we regularly see evidence of this trend. One-bedroom suites are selling like hotcakes, and I would guess that approximately 25 to 30 per cent of our sales for our clients are to female buyers. Some of these women are savvy investors who recognize a tremendous return-on-investment opportunity; others are purchasers who intend to live in the suites they buy because they appreciate the community and security aspects of condominium living. They come from all ages and walks of life, from first-time buyers wanting to get into the market and start building equity, to seasoned professionals who see the value in living close to where they work, to widowed women who live alone. Even today’s compact suites offer spacious living because of their efficient layouts. In addition, people need less space in a condo because of the wonderful amenities included in the building. When you have a large fitness centre only an elevator-ride away, you can use your personal space for things other than exercise equipment. Women also appreciate the immediate community that comes along with living in a condo. Amenities are gorgeous spaces for interacting with neighbours, and the Concierge provides screening for visitors and “eyes on the street.” Modern features such as monitored cameras in the underground parking garage, enter phone and in-suite security systems also add a level of security. Plus, in a condo, there is always someone close by when you need help. Last, but not least, condos offer that glorious sense of freedom when travelling. Just lock the door and leave, knowing that your “baggage” does not have to include worry about maintenance and upkeep. For professional women who travel regularly, this is very important. Women are really coming into our own in the world, and I say viva the condo! In Toronto’s West Don Lands, the fabulous Canary District community is well under construction, and the site is a hotbed of activity. It is rare in our city that developers build before launching sales, but Dundee Realty and partner Kilmer Van Nostrand did just that. 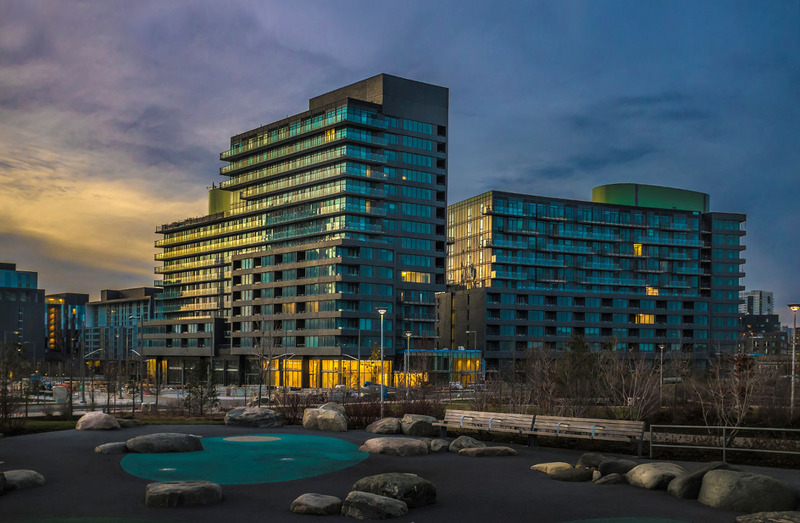 This visionary neighbourhood has certainly captured the imagination of both investors and end-users for numerous reasons, especially the community’s connection with the 2015 Pan Am & Parapan American Games. If you are thinking of visiting the site to have a look, now is the perfect time, as the new Presentation Centre at 398 Front Street East is a sight to behold! As you walk up to it, you will notice how wide the community boulevard is and really gain an appreciation for the impact Canary District is having on the area. You will also realize why this community has such a high Walk Score® when you notice how many amenities are just steps away, and why it was chosen BILD’s 2014 Community of the Year – High-Rise! One of the major draws to Canary District is its proximity to newly opened Corktown Commons park, which features a playground, amphitheatre, splash pad, pavilion and hundreds of trees! This fits well with the developers’ master plan, which promotes health and wellness. The pedestrian-friendly neighbourhood’s tree-lined boulevards and walkways will encourage residents to leave their vehicles at home. Just steps away, they will have a YMCA, George Brown College student residences, retail stores, cafés, restaurants, recreational services and other parks. The recently restored Distillery District is also just a brief stroll away. Two LEED® Gold-certified buildings will house the athletes before being repurposed as a condominium residence. Sales thus far involve the spectrum of buyers from first-time, move-up, re-sizing and investors. The one, two and three-bedroom (some with dens) suites come with high-quality standard finishes. The newest building, Canary Park Condominiums, is attracting major attention. To find out more about your current residential choices, visit CanaryDistrict.com or call 416-603-7576. 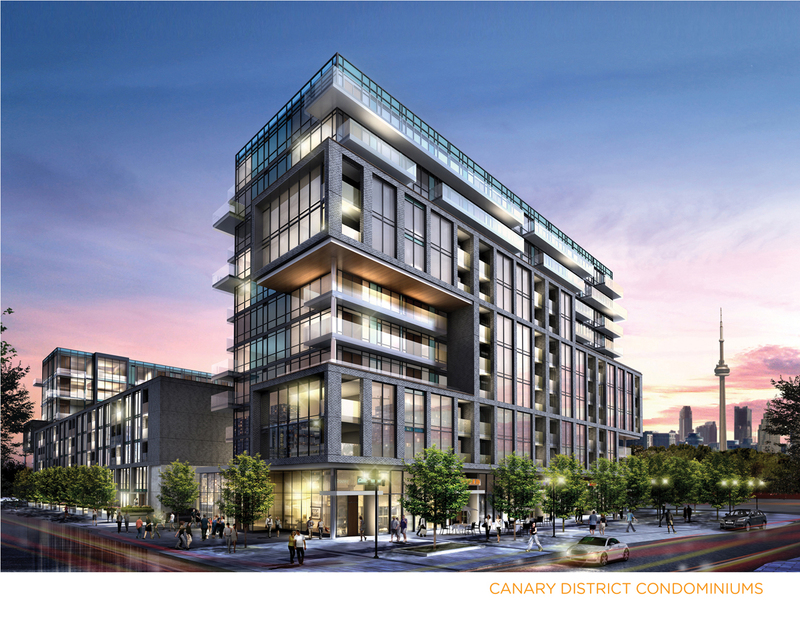 Everything is surging ahead at Canary District Condominiums, where the final crane has gone up in February, and the entire community will be under construction! This visionary new neighbourhood has been a huge success since sales were launched on the first building last year. It has also received massive media attention because of its international role during the upcoming Para / Pan Am Games. As the Athletes Village, this evolving section of Toronto will have the eyes of the world on it. Canary District is helping to revitalize the West Don Lands, and the entire process is incredibly exciting. Two LEED® Gold-certified buildings will house the athletes before being repurposed as a condominium residence. The first, which is now selling, has attracted a fascinating diversity of buyers, including first-time, move-up, move-down and investors. The one- and two-bedroom (some with dens) suites begin from just the $270,000s and come with high-quality standard finishes. Dundee Realty and partner Kilmer Van Nostrand are doing a beautiful job of bringing the Village to life. The area’s redevelopment has also involved the City of Toronto, Waterfront Toronto, Infrastructure Ontario and some local community groups. This brilliant master plan offers an enviable lifestyle. The community will feature walkways connecting a wealth of amenities such as a YMCA, George Brown College student residences, retail stores, cafés, restaurants and recreational services. Residents will also be able to walk to the recently restored Distillery District. With exteriors by KPMB Architects and interiors by Munge Leung, the two towers in the first release feature ceiling-to-floor glass for gorgeous views of the green space, courtyards and pedestrian mews. The stunning glass-enclosed recreation facility will feature party, billiards and dining rooms and a gym. To find out more, treat yourself to a visit to the Canary District presentation centre with its high-tech interactive terminals. The website is at http://www.canarydistrict.com/, or call 416-603-7576.